Our own brand of Titan Jewellery titanium rings. Titanium rings with sterling silver inlays. Our range of titanium bracelets & titanium bangles. Titanium Rings from the Unique & co range. Information about our titanium jewellery, and packaging options. Some of the questions we are asked. Our Titanium Jewellery consisting of Rings, Bracelets and Bangles. have been rated 10 out of 10 based upon more than 430 customer reviews. We believe we have one of the largest selections of titanium jewellery in the UK with every advertised product in stock. With nearly 70 different designs, and available in up to 24 different sizes, and the option to set coloured gemstones, or diamonds means that our range is configurable to several thousand items of titanium jewellery. Our range of men's titanium rings and titanium wedding rings are typically available in UK finger sizes P to Z+6, whilst our Women's titanium rings are available in UK sizes I to S.
Each item of titanium jewellery will have our own unique titanium logo laser engraved, and the option to have a matching gift presentation box. All of our titanium jewellery is made from hypoallergenic titanium so as well as being both strong, and light it is also a fabulous product for those with sensitive skin. As well as our Titan Jewellery brand of titanium rings, we also have a few ranges of titanium rings from leading British manufacturers on our other website on a made to order basis. For a selection of titanium rings in a low profile then our Ti2 Titanium Rings are a great choice. 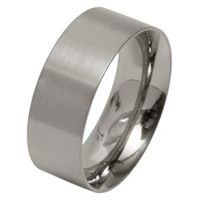 For a more configurable titanium ring then our Geti Titanium Rings are very popular for men's titanium wedding rings. To view our Geti or Ti2 rings you can click the links at the very bottom of this page, which will take you to our other websites.